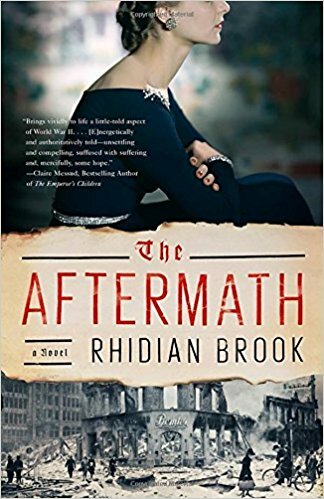 The Aftermath by Rhidian Brook depicts a time and place not often depicted in literature: post-WWII Germany–specifically, Hamburg in 1946. The Aftermath tells the story of a British officer, his wife, and their young son sharing a requisitioned home with a German man and his teenaged daughter. This situation proves ripe for drama and clashing relationships and tensions, and Brook delivers. A note at the back of the book explains that the author got the idea from his Grandfather who hared a house with a German family after the war, which from what I understand, was certainly not the norm. English couple Lewis and Rachael are distanced after the war, Lewis rather hung up on the idea of Rachael, and Rachael suffering from most likely a form of PTSD after the loss of someone close (I won’t say who due to spoilers). Lewis and Rachael are almost foils to each other: Lewis holds everything in while Rachael lets everything out despite her best efforts at the typical English stiff upper lip. Their son, Edmund, on the other hand, is relatively upbeat and curious despite the impacts of the war and witnessing the devastation of post-war Germany. Orphans of all ages run free in hodge-podge found clothes, scavenging food and belongings, squatting in abandoned homes, and desperately seeking prized cigarettes or food from the British soldiers. The orphans engage in a type of black market trade, with cigarettes being the main currency, and Edmund getting caught up in the plight of the Orphans. Brook offers brief vignettes of the German family, Stefan and Freda, but I found their characters thinly painted. More time seems to have been spent fleshing out the English family. I would have liked to have gotten to know Stefan and Freda much more than Brook offered. The Aftermath, at times, falls into the trope of the emotionally frozen marriage and the subsequent actions of husband and wife; one party inevitably being “awakened” by adultery. I won’t speak too much on that subject given the spoiler-territory, but I will say that while that aspect was enjoyable to read, it was predictable. I found myself distracted by the author’s thesaurus-happy tendencies, perhaps because I don’t like writing that tries to elevate itself by posh language rather than theme at the risk of becoming pretentious. Maybe that’s just my egalitarian outlook in general, although I do obviously understand the importance of people learning new words from reading. My main issue with The Aftermath is that is seems to be an incomplete book. The ending was quite abrupt and although there is allusion to closure, I felt there was no closure for any of the characters, which was very unsatisfying. Fun fact: The Aftermath, as we speak, is being made into a film, which I will most certainly see!